Terrific Trinity claimed back-to-back wins on Tuesday night to climb out of the National League North relegation zone. A minute into the second half Craig King finished well after a great cross by Ashley Worsfold. His strike was enough to defeat play-off hopefuls Chorley at the Northolme. Superb saves by Henrich Ravas preserved the lead. His best came six minutes after the goal when Josh O’Keefe looked certain to score, but the Slovakian keeper mades a terrific one-handed stop. After another good save from Ravas, this time using his feet to deny Khuis Metz, defender Michael Jacklin cleared a Josh Wilson effort off the line. Trinity, unchanged from Saturday’s win, created the first chance after a quiet start. Craig King glanced a header wide after good work by Liam King and Ashley Worsfold before Worsfold fired wide when through on the right. Chorley, matched by the home side for most of the first period, finally carved out an opportunity of their own on the half-hour, but Jason Walker was off target. Six minutes later there was a let-off for Trinity as Adam Blakeman hit the post and on half-time keeper Ravas did well to keep out Marcus Carver’s goalbound drilled shot. The 1-0 victory was enough to lift Trinity upto 17th place in the table and give their relegation fight crucial momentum. A fully committed performance, watched by 387 fans, delighted manager Dave Frecklington, who had called for his side to show more consistency in the second half of the season. 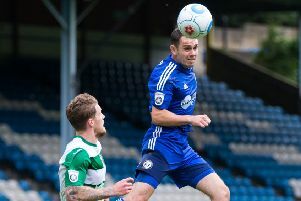 Trinity resume their survival fight on Saturday at relegation rivals Curzon Ashton.